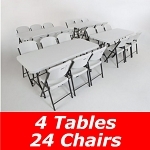 Buy the Lifetime commercial grade tables and chairs set and save money! 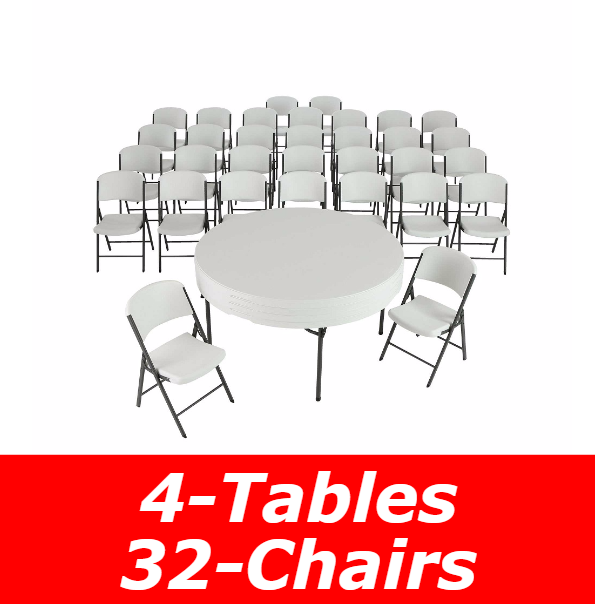 When you invest in this set of four Round Lifetime Folding Tables (Model 480301) and thirty-two Lifetime Folding Chairs (Model 2802) you'll not only save money and you will also get Lifetime's 10 year warranty; the best in the market. 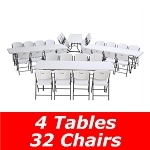 Number of Tables and Total Seating: Depending on your intended use this package of folding tables provides enough seating space for Includes 4 tables and 32 chairs total. Leg Style: Straight - Legs go straight down to a horizontal bar adding stability. The broad leg stance maximizes stability. Leg Locking Mechanism: Locking Mechanism - prevents unintentional closing of table. These are also available in bulk single packs, 4 packs, 15 packs, 32 packs, and we encourage getting a special quote on large quantities by contacting us by phone toll free at 866-308-5484 or using our online chat function. 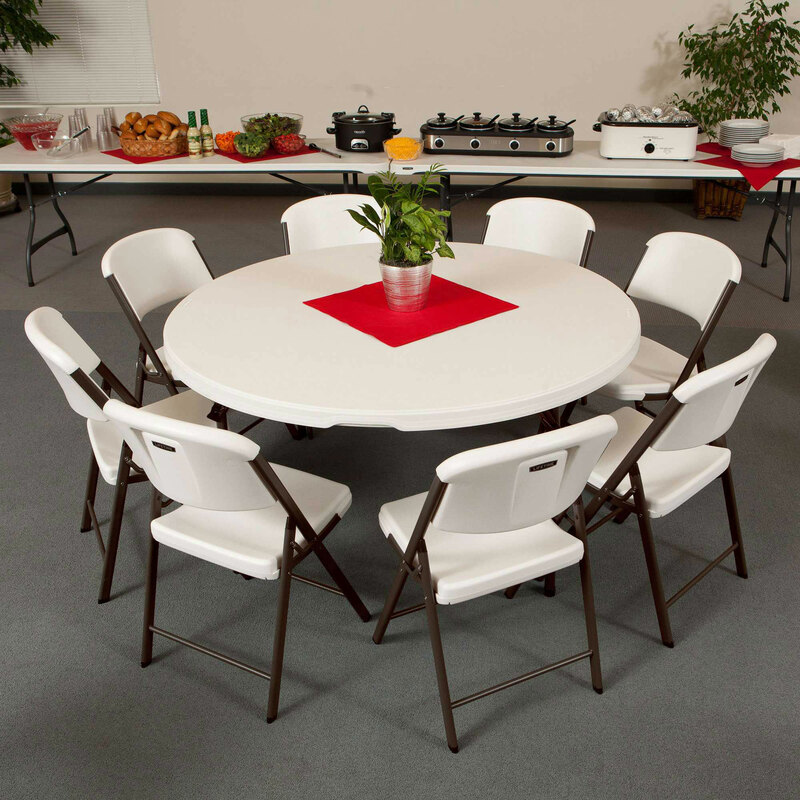 Common Uses Include: seminars, banquets, wedding receptions, classrooms, trade shows, teacher lounges, cafeterias, restaurants, cafes, outdoor gatherings, picnics, RV camping spots, KOA's, Sunday school classes, conferences, seminars, scrapbooking, home crafts, wood shops, patios, and more. The warranty covers normal use. 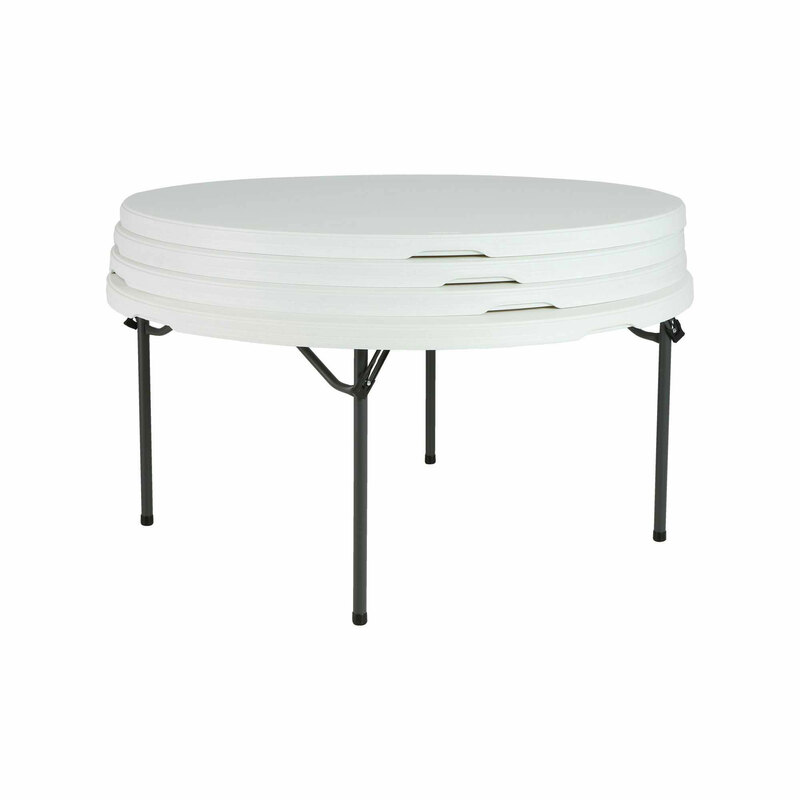 Because these tables are so durable there are very few warranty claims. Generally, filing a warranty claim requires a few digital photos of the defect as well as a copy of the receipt. Please retain a copy of your dated sales receipt should you need to file a claim in the future. Also, we do keep a copy of your receipt on file for just that purpose. These products are built with top-notch quality and we want to make that clear to our customers. Shipping is free within the 48 States. Number of boxes for this product: Ships on a pallet with all the tables shrink wrapped and secured to the pallet. Separated with cardboard spacers. Ships via: Common Carrier such as Roadway, ABF, Estes, Old Dominion, etc. This item is too large for FedEx or UPS. Signature is required. Freight carrier calls beforehand to schedule a delivery appointment. Lead Time: Generally ships out the following business day after order is placed. Shipping can take between 3 to 10 days depending on your location. Item ships from Clearfield, Utah. Tracking numbers: Tracking information is automatically emailed to you once the order ships out. Damaged shipments are extremely rare. Should anything be damaged upon arrival please note that with the driver or refuse shipment if you are able to. We'll send out a replacement at no cost to you and we'll file the freight claim making it a painless process for you. If you don't see the answer to your question please email us and we'll post it. 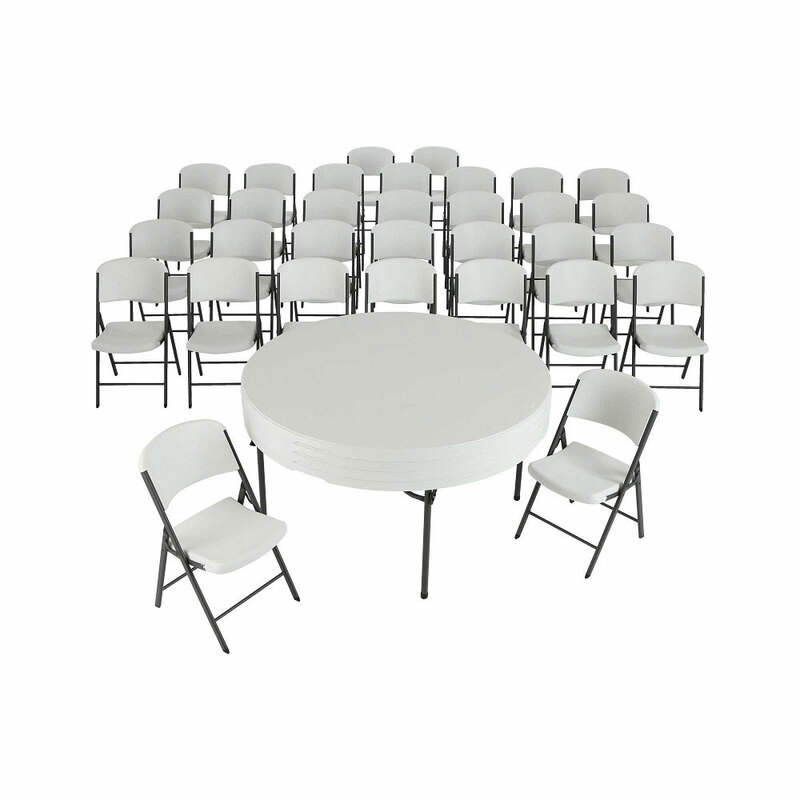 Most of our tables have chairs that match. 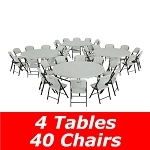 Please scroll down to the very bottom of this page to see matching chairs or other table purchasing quantities. The table storage cart designed to fit these tables is model 80339 (previously 6520) Click here to view the cart including pricing and availability. Q: How is this delivered and how long does it take? A: This ships on two pallets and goes through an LTL carrier. Depending on your location it can take about one week to receive. 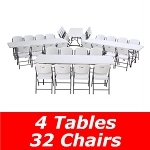 Shipping: Orders for the Lifetime Table and Chair Combination Set generally leave the warehouse the next business day. Dimensions: 64" x 64" x 70"